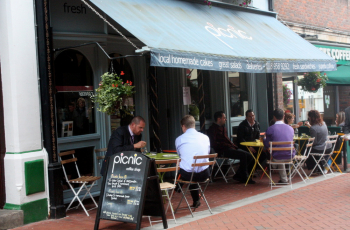 Picnic is an independent café located in the heart of Reading town centre. They have been established at 5 Butter Market since the summer of 2007. Specialising in ethical coffee and locally produced food and with a unique welcoming atmosphere, they attract a varied and discerning crowd of people who live or work in Reading, as well as shoppers and even visiting artists. They serve ethical coffee, Fairtrade teas and hot chocolate, juices and smoothies; a range of breakfast options, like cereals, toast, pastries and croissants, freshly made sandwiches using locally baked bread; Picnic Boxes featuring Hampshire-grown salad; award-winning soups from the Dorset Blue Soup Company and snacks, including samosas, crisps and fruit, as well as delicious cakes and organic ice cream. They also sell products to take away including picnic hampers, pickled cabbage and onions and cookery books, as well as cakes, and provide a business lunch catering service. They are proud to offer an independent alternative to the people of Reading, and were voted - Independent retailer of the year 2010 at the Reading Retail Awards.